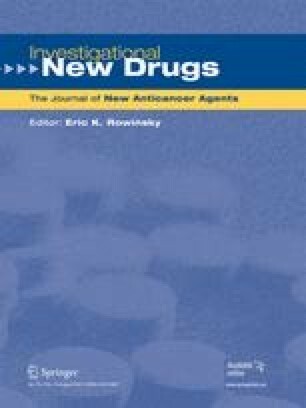 This phase II study evaluated the antitumor activity of the tetracycline analog COL-3, a potent inhibitor of metalloproteinases (MMPs), particularly MMP-2 and MMP-9, on a continuous oral schedule at a dose of 50 mg/m2 daily in patients with advanced and/or metastatic soft tissue sarcoma (STS). The principal endpoints were the rate of objective tumor regression and the proportion of patients who did not experience disease progression during the first 8 weeks of treatment. Other study objectives included an assessment of pharmacology of COL-3, time to progression (TTP), and overall survival. A Simon two-stage design with multinomial stopping rule was employed, with 15 patients enrolled during the first stage of the study. Although COL-3 was generally well-tolerated, there were no objective responses and 5(33%) patients experienced disease progression during the first 8 weeks of treatment, which exceeded the criteria established a priori with regard to pursuing further evaluations of COL-3 in STS. The median values for TTP and survival were 109 and 279 days, respectively. Based on these results, further studies of COL-3 on this administration schedule in patients with STS are not warranted. The study was supported by a unrestricted grant from CollaGenex (Newton, PA).